the preconditions of a theory [of cyberdemocracy] are impressively explored. a highly mobile and sophisticated discussion of the benefits and liabilities of virtual environments. explores a range of theoretical terrains that few works have had the energy to engage. he Internet raises provocative questions about democratic participation: Must the public sphere exist as a physical space? Does citizenship require a bodily presence? 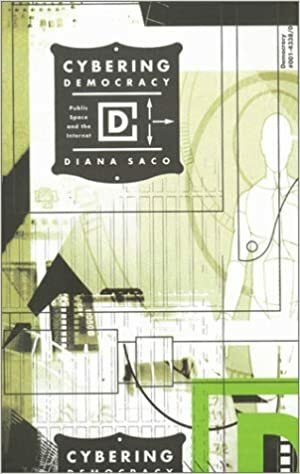 n Cybering Democracy, Diana Saco boldly reconceptualizes the relationship between democratic participation and spatial realities both actual and virtual. She argues that cyberspace must be viewed as a produced social space, one that fruitfully confounds the ordering conventions of our physical spaces. Within this innovative framework, Saco investigates recent and ongoing debates over cryptography, hacking, privacy, national security, information control, and Internet culture, focusing on how different on-line practices have shaped this particular social space. In the process, she highlights fundamental issues about the significance of corporeality in the development of civic-mindedness, the exercise of citizenship, and the politics of collective action.